If there are no enemy creatures and I reap with Kindrith Longshot, do I have to deal damage to a friendly creature? Yes. You always resolve as much of an effect as possible. Therefore, if your opponent has no creatures in play, damage one of your own creatures. 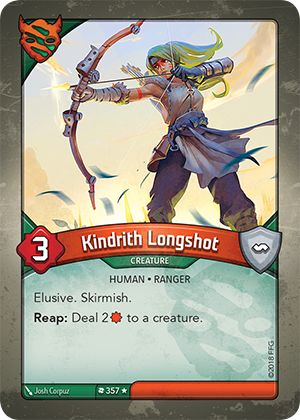 If Kindrith Longshot is the only creature in play, it would damage itself. Can I use Kindrith Longshot’s “Reap:” ability on my own creatures? Yes. There is no wording in this ability that limits which creature can be damaged (e.g. “enemy creature” or “friendly friendly”). Therefore, this ability can be used to damage any creature in play.